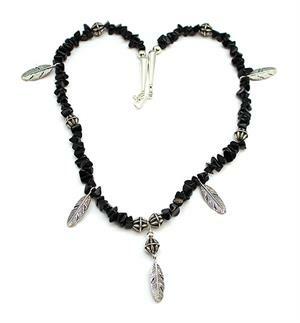 This necklace is strung using black onyx chip with silver plated feathers, beads, cones and hook and eye. It measures approximately 20" long. Center dangle measures 2" long. Feathers on the side measure 1" wide pointed out. It is Navajo hand made by Naomi Garcia. Now only this one available.